Swarming is how honey bees reproduce at the colony level. The queen will leave the hive along with up to half of the worker bees. The swarm will cluster out in the open, often on a tree limb, while scout bees seek a suitable home. Sometimes a swarm will move on within a few hours, sometimes it may take a few days. When bees are swarming they are the least aggressive and not very likely to sting. It is always a good idea to call a beekeeper if you see a hanging swarm because they are easy to catch at this point. Many times these swarms will find a hole in the side of a building and will move into an attic, eaves, or wall. Once they’ve moved in it is rather difficult to remove them. To find a beekeeper, start with your local beekeeping association. We have a list of local bee associations in Tennessee. 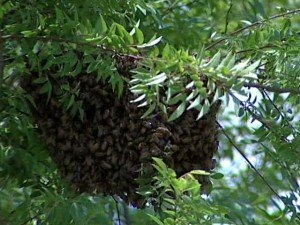 You may also want to contact your local UT Extension Office to see if they have a list of local beekeepers who can catch swarms. You can also contact a beekeeper if you have bees living in your wall, attic, or a tree that need to be relocated. However, this is a much more complex job and not all beekeepers will be able to help. Those that do may charge a fee.